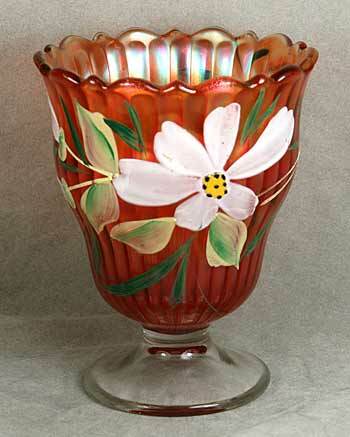 The Magnolia enameling is usually found on Fenton's interior drape pitchers, but at least two sets are known to be on interior coin dot pitchers. The tumblers have an interior rib and enameling with varying numbers of blossoms hanging down. 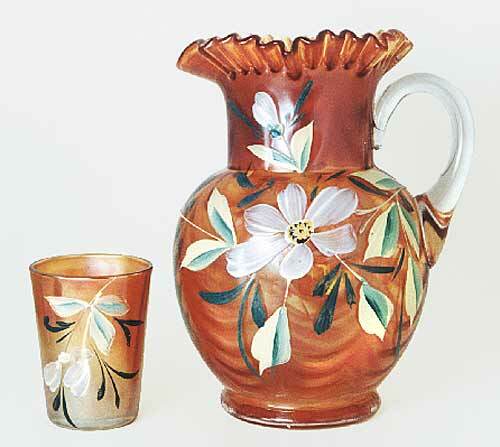 Another take on the Magnolia water sets, this time on a tankard-style pitcher rather than interior drape. 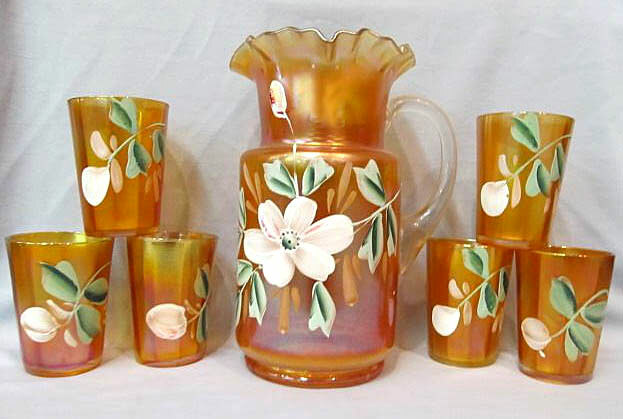 This marigold 7-piece water set sold in 2014 for $275. Photo courtesy of Wroda Auctions. Updated 12/22/2017 In 2012, Terry Jondahl sent me this photo of his five-inch tall marigold footed vase with enameled magnolia decoration. It's the first I've seen of this shape, and is particularly nice with the decoration. In 2013 he sold it on eBay for $65.99. In 2014, a marigold 4-piece table set with Magnolia decoration sold for $300. The spooner was a perfect match for this piece, so that's what this must be, rather than a vase.